Purslane (portulaca oleracea) is a succulent herb from the same family as the moss rose. In most regions of the country it is an annual but is a tender perennial in zones 9-11. It has smooth, round reddish stems that trail along the ground almost like a vine, tear-drop shaped juicy leaves and small yellow flowers which are open for only a few hours on sunny mornings. The seeds are formed in a tiny pod, which opens when the seeds are mature. Purslane has amazing survival skills. Its taproot goes deep into the soil with fibrous secondary roots near the surface making it able to tolerate poor, compacted soils and drought. When water is scarce, purslane’s leaves remain shut during the day to prevent water loss into the atmosphere and open at night to collect carbon dioxide which it converts and stores as malic acid. During the day the malic acid is converted into glucose and used for photosynthesis. Although purslane prefers the fine textured soils of seedbeds as in vegetable gardens, it can grow even in gravel driveways. Purslane also has amazing reproductive traits. Its prolific seeds have been known to stay viable for up to 40 years in the soil. In addition to the incredible seeds, a purslane plant that has been uprooted but not removed or even just a piece of a stem will root back into the soil. So tilling the purslane can be a way to multiply the plants! On the other hand, purslane can serve as an handy companion plant as it not only provides ground cover to help retain moisture but its deep roots actually bring up moisture and nutrients for other plants to use. Some plants, including corn, will "follow" the purslane’s hardy roots down through hard soil that they cannot penetrate on their own. Purslane contains more omega-3 fatty acids (essential for regulating metabolism) than any other leafy vegetable plant. The human body cannot manufacture omega-3 acids and must get them from food. In nature omega-3 acids are found in oily fish, aquatic plants such as algae, and flax seeds (which must be ground before the body can absorb it)...and purslane. Purslane provides six times more vitamin E than spinach and seven times more beta-carotene than carrots. It’s also rich in vitamin C, magnesium, riboflavin, potassium and phosphorus. Purslane also has a high level of pectin, a soluble dietary fiber which binds to cholesterol in the intestines, slowing glucose absorption and reducing blood cholesterol levels. Since it is a succulent, purslane contains a significant amount of mucilage -- a thick, gluey substance -- and is beneficial for thickening for soups and stews. Although generally considered to be just a weed in the United States, the stems, leaves, flower buds and seeds are all edible. As a food, cultivated purslane has better flavor and is easier to harvest because it grows more upright than the wild types. This much maligned and hearty little “weed” has shown up again and again throughout history and throughout many cultures. Theophrastus (371-287 BC), often considered to be the father of botany, named purslane, as one of the several herbs that must be sown in April. Pliny the Elder (AD 23 - AD 79), Roman author, naturalist and philosopher, advised wearing the plant as an amulet for protection from evil. The Aborigines in Australia crushed the seeds from purslane and other plants to make a dough they would bake into seedcakes before the arrival of milled flour. Years ago a dish called burek became popular in the area of modern day Turkey and spread throughout the Ottoman Empire. It has acquired many variations of names and ingredients as it spread. In Greece it is boureki. In Bulgaria, byurek and boureka comes from Israel. The shape of the dish and the ingredients may vary but the common factor is the thin pastry with a filling – meat, cheese, fruit or vegetables. 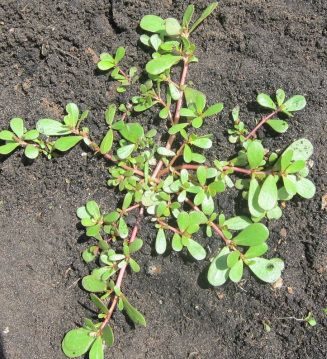 Purslane is also used extensively in soups and salads throughout the Mediterranean area. 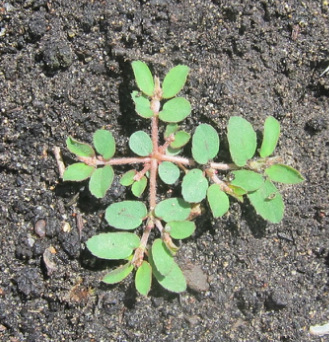 The Japanese use purslane as one of the seven herbs in their symbolic New Year's ritual dish called nanakusa-no-sekku. The Russians dry it and can it for the winter. In Albania purslane is used as a vegetable similar to spinach and in Portugal, purslane is a common soup ingredient. It has been a food crop for centuries in India and was one of Mahatma Gandhi's favorite foods. While living at Waldon Pond, Henry David Thoreau wrote, “I have made a satisfactory dinner, satisfactory on several accounts, simply of a dish of purslane (Portulaca oleracea) which I gathered in my cornfield, boiled and salted. I give the Latin on account of the savoriness of the trivial name” (chapter 1, “Economy” part 4). In Latin America purslane (verdolaga) is so popular that a major professional soccer team in Colombia is nicknamed Los Verdolagas (The Purslanes). Verdolaga is also a nickname of a popular sports club in Buenos Aires, Argentina. Use purslane in salads or on sandwiches instead of lettuce or pickles, steamed, stir-fried or pureed, sauteed boiled as a side dish (boiling removes the tartness), as a substitute for spinach or added added to soups and stews to help thicken the broth. Some people add purslane, leaves and stems, when making pesto. Because it’s so juicy, purslane reduces the need for additional oil making a reduced-fat pesto. When foraging for purslane, watch out for spurge, a poisonous plant that often grows with purslane. Spurge also has a taproot and grows along the ground, but spruge leaves are not succulent and are more bluish-green than purslane. 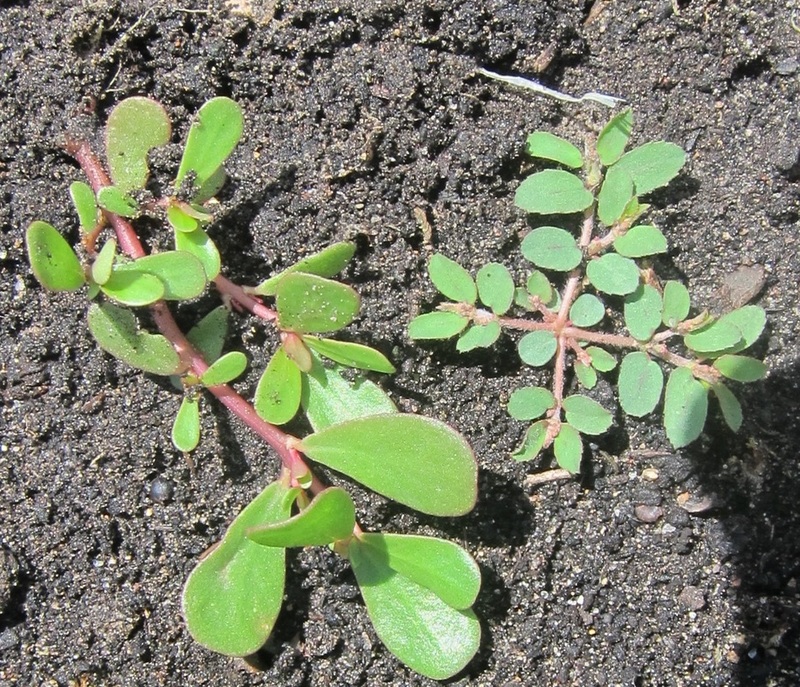 Purslane stems are thick, spurge stems are more wiry. Finally, spurge has a white, milky sap in the stem that can irritate the skin on contact or the intestinal track if eaten. Purslane stems are filled with clear water. Purslane should be thoroughly washed and drained before using. To wash purslane add a few drops of vinegar and a little salt to water in a container and swish the purslane around in it. This will kill any potential bacteria and the soil will wash off the plant and sink to the bottom. Heat oil on medium high heat in a medium-sized skillet. Add onion sauté for several minutes until the onions to starts to soften. Add purslane and continue cooking until purslane wilts slightly. 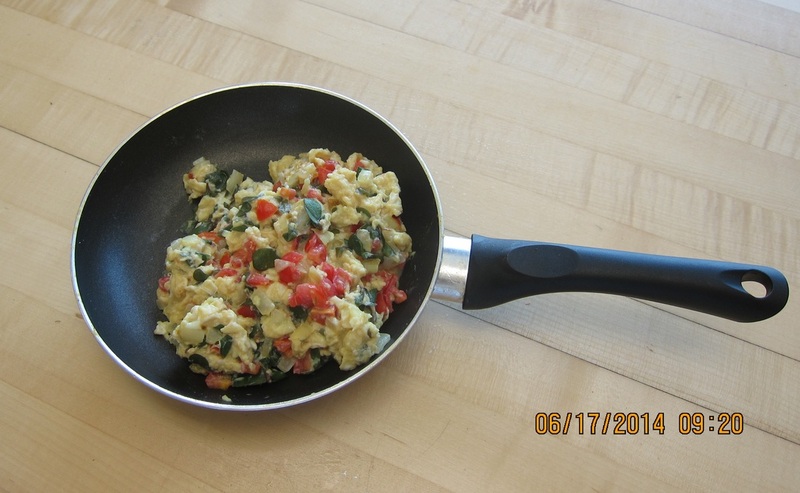 Beat the eggs, salt to taste, and add to the skillet. Some recipes don't call for the tomato, but if you choose to add it this is the time. Cook, stirring continually. Serve hot with salsa and tortillas. The red tomatoes and green purslane reminded me of the Mexican flag. Peel, seed, and chop the cucumbers. Wash the purslane well and remove the large, tougher stems. Chop coarsely. Add mint, cilantro and chervil. In a separate bowl, stir together the yogurt, olive oil and garlic, coriander and season to taste with salt and pepper. Stir the yogurt dressing into the salad and serve chilled. Drain and plunge the cooked potatoes into cold water to cool them quickly. Dice. Wash the purslane and chop coarsely. 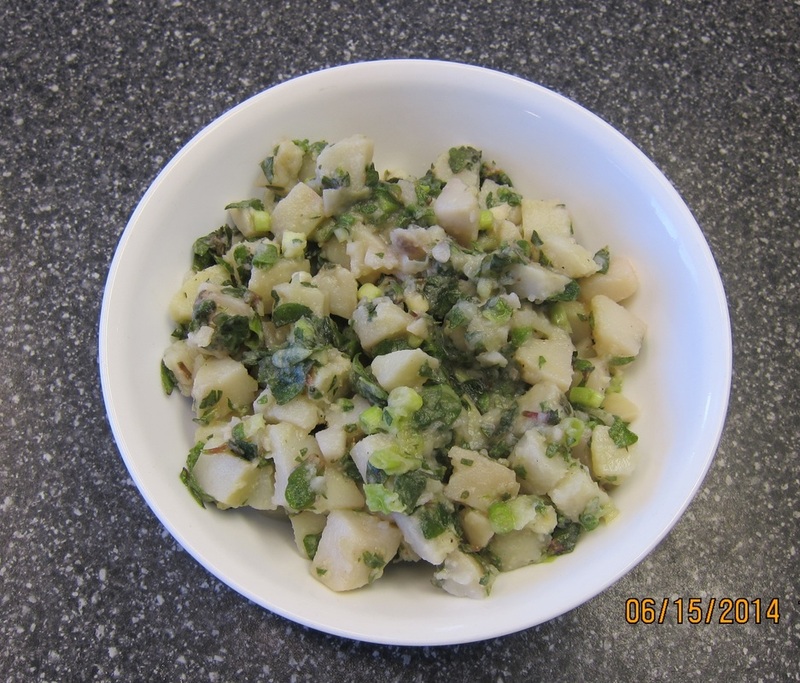 Add purslane and onion to potatoes. Blend lemon juice, vinegar, garlic and mustard in a blender. With the blender running on low slowly add olive oil. Add tarragon and salt and pepper to taste. Pour desired amount of dressing on the salad and serve chilled. Mix the dry ingredients together and add water little by little until a soft and non-sticky dough forms. Cover it and let it rise for up to an hour. Meanwhile, heat olive oil over medium heat. Sauté onion and red bell pepper. Add tomatoes into it and cook until tender. Remove from from heat and add purslane. Add cumin and salt and mix well. Let cool. When the dough has risen, knead slightly on a floured surface and divide into small balls. Roll the dough thinly into a circle and put filling on ½ of the circle leaving ½ around the edge. Fold the other have of the dough over the filling and seal the edges. Fry until lightly browned on both sides. Heat olive oil in a pot. Saute onion. Add tomatoes, potatoes and carrots into the pot. Cover and cook it a few minutes. Add water and rice. Cook until potatoes and carrots are tender, about 20 minutes. Add the purslane and cook another five minutes. Salt and pepper to taste.